Boost Swimming from BOOST SWIMMING on Vimeo. Coach Jeff Pearson of Boost Swimming counsels triathletes on how to take the proper angles to cut precious seconds and even minutes off their swim times. Jeff Pearson is part coach, part physicist, part limnologist and part meteorologist in his pre-swim pep talk to about a half dozen athletes gathered at Carnelian Bay’s Watermans Landing. 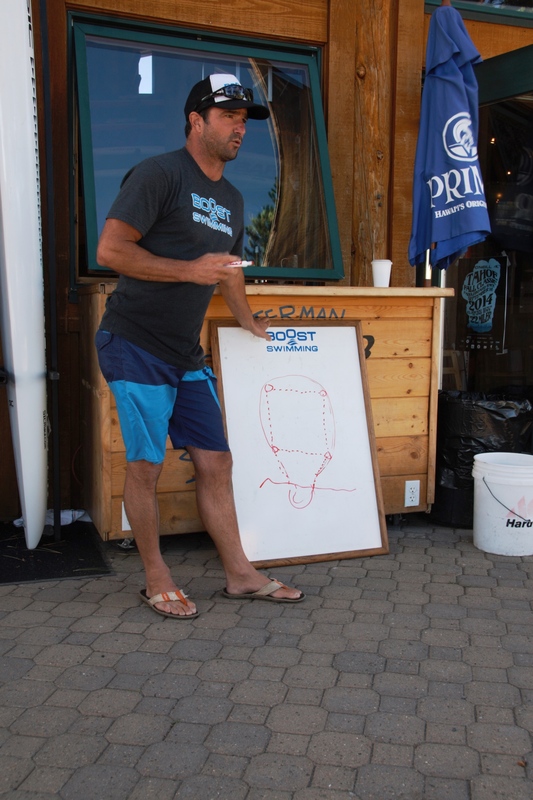 He sketches out angles on a whiteboard like a geometry professor, counseling his students on the right way to account for wind-drift while competing against other swimmers in an open-water environment. The former two-time USA National Swim Team open water national champion and 20 year coach–whose proteges include two 2012 Olympic medalists–breaks down breathing technique, proper sighting (how to gain your bearings on a race buoy without sacrificing time and strokes) and how to navigate waves before releasing his swimmers into a severely choppy Lake Tahoe last week, where waves were two-to-three feet. Pearson runs Boost Swimming, a two-year-old business meant to prepare athletes for open water swims, most notably triathlons like IRONMAN. 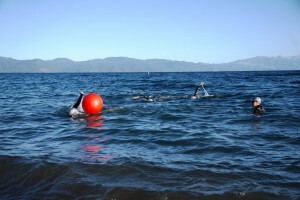 Boost runs in-water training courses twice per week on Tahoe’s North Shore starting in mid-June and continuing throughout the summer. Boost swimmers are coached to use a modified stroke when turning around buoys to minimize the distance of the turn, shaving seconds off their time. I can attest to this. A good friend of mine who is a seriously terrific athlete–you’ll find him at the head of the pack in local uphill races and all manner of trail rides–was anxious about competing in this year’s IRONMAN Tahoe because of his lack of swimming experience. 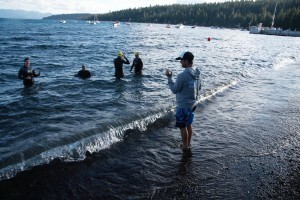 I found more and more triathletes or potential triathletes with the same concerns–very good athletes outright scared of the water, never mind Tahoe’s sometimes punishing waves and cold. Pearson’s instruction was valuable right away. 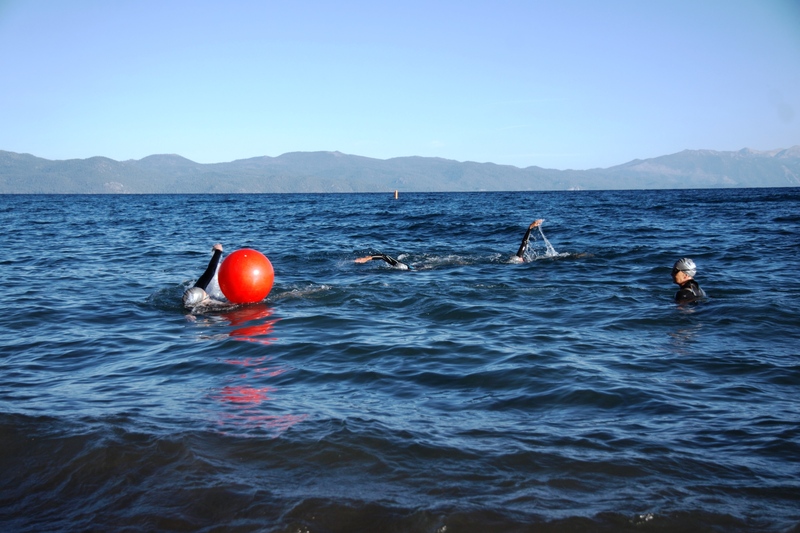 He set up three buoys–two parallel to the Carnelian Bay beach, one at the triangle’s apex in deeper water–to simulate race day at a tri, where you’ll find four main buoys. Pearson stressed the importance of breathing to your righthand side when swimming parallel to shore. It’s that sort of firsthand experience in The Lake rather than a calm pool environment that Pearson says is the most valuable part of his classes. Pearson coaches his swimmers to maintain proper body alignment during their races–to keep their bodies parallel with the lake bottom rather than becoming too upright and losing streamlined speed. To complement the open-water training exercises, Boost also offers one-on-one instruction, stroke analysis via video and a whole host of camps and clinics. The summer open water series is $20 for drop-ins and $150 for a season pass. For more on Boost, check out its website.